The Terrafirma range of 'de-cat' down pipes and silencer replacement pipes are intended to improve the performance and economy of diesel Land Rovers. Save a fortune when your catalytic converter fails by fitting a Terrafirma 'de-cat' down pipe and enhance the performance and economy by derestricting the exhaust system. UK MOT regulations suggest a maximum weight limit, above which a catalytic converter is not required. 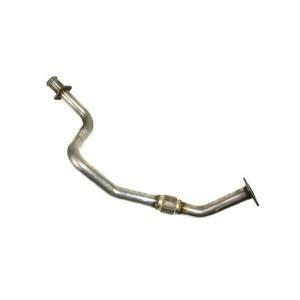 This permits replacement exhaust systems to be fitted. These pipes fit directly to the original system and require no modification. Remove the power restricting and vulnerable centre silencer and fit a Terrafirma free flowing silencer replacement pipe and enjoy the new throaty exhaust sound. Made from 1.5mm 409 stainless steel these pipes will considerably outlast the life of the existing original system. 409 is easier to bend and weld and is not prone to cracking due to vibration like other grade of stainless steel. This listing is for a Terrafirma 'De Cat' down pipe Defender Td4 2007 onwards model.